Hi everyone! Today I’m featuring a card I made with the July paper pumpkin kit. The stamps are cute and feature a “sparkle theme”. The bottom of the card was material from the kit and I used some shinney copper paper I had. I also used the shinney copper paper and used the swirly bird thinlet for a backround to the greeting paper. I used some copper tinsel type material to divide the two papers and used the diamond stamp on the shinney copper stamped in an old color, dusty durango. I embossed the “brilliant” word in copper which is available in this years catalog. Stampin Up also offers copper thread this year which would also look nice with this card. The greeting and the bling on the tag are both stamps in the set included in this months kit. As a final touch, I took a pearl and colored it with a copper sharpie. This was a fun card to make and I love the copper. Besides the intended projects, it is so fun to think of alternative ideas each month that can be made from the kits. The Swirly Bird stamp set is so versatile! Here are some kites made using the set. Two of the new in-colors were used here. Emerald Envy and Dapper Denim. The new in-colors are really great this year. I have made so many cards already from this one stamp set. There are 24 stamps in the set and you can make swirls, kites, flowers, birds in a nest, sailboats on a sea and many more interesting cards with this set. There are also matching thinlet dies that can be purchased with the stamp set. In fact, you can buy both in a bundle and save 10%. The bundle includes both the stamp set and the thinlets and the catalog number for the bundle is 142353. The stamp set catalog number is 141749 and the thinlet catalog number is 141497 (9 dies) if you wish to purchase separately. To purchase go to my 24/7 online store at http://darleneseitz.stampinup.net . For a limited time only, Stampin Up is offering this new bundle (bundle includes stamps and thinlit dies). It will be available from August 2 thought August 31 2016 (ends at 6:50p.m. on that day). This is also the time you can spend your Bonus Dollars earned during July 7-31 2016 (see previous post for details). Just wanted to give you a heads up. The cost of the bundle will be $52.00. You can also buy just the stamps or the thinlets separately but you save 10% by ordering the bundle. 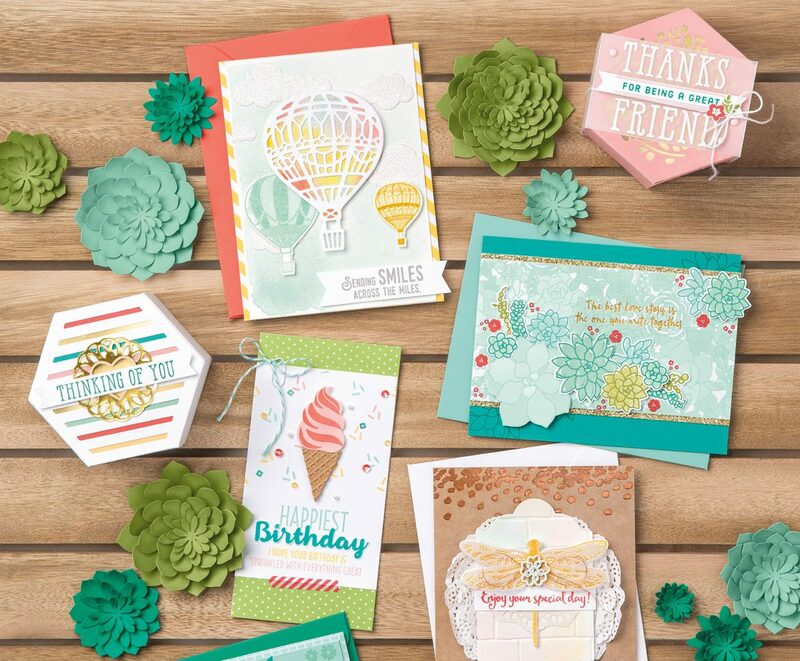 Here are several cards made from the June Paper Pumpkin Kit. Paper Pumpkin is a complete craft kit sent to you every month. It includes everything except scissors ! That means ink, a stamp set, die cuts, embellishments, card bases, adhesive and directions. You can sign up for just one month or in increments of 3 months up to a year. It costs 19.95 including shipping and is a fun treat to yourself once a month. What is in the kit is a surprise when you receive it and could be cards or a papercrafting project. Go to paperpumpkin.com to order. Be sure to use demonstrator code 2096764 when ordering. These cards are indivduals projects that another demonstrator (Jenny Hayward) created and I made with my kit. You can make the intended project or create your own creative projects, or go on line to see what others have made with the kit. Stampin Up always has a video on youtube for the intended project. Please contact me thru this blog or at darstz@hotmail.com if you have any questions. Have a crafty long weekend!